You are here: Home » Canada’s view on Disabled Students,one word, pathetic! Canada’s view on Disabled Students,one word, pathetic! I was very curious to see how Canada is dealing with Disabled Students and went on the Canada Statistic site and view what result I would get from it. I don’t think that amount will correspond to all the need of a disabled student when they have difficulty to have the acceptance to have The Canada Study Grant for the Accommodation of the Students with Permanent Disabilities. They have the disability; it is not like they are pretending to be disabled! In addition to my statement there is the factor of being accepted to the Grant…We see how beautiful these none sense is written. I found it really pathetic! studies at a post-secondary level. Loan. You must then complete and submit a separate application form for the Canada Study Grant for the Accommodation of Students with Permanent Disabilities. Contact your Provincial or Territorial Student Assistance Office or educational institution to apply for loans and receive the application form for the Canada Study Grant. Next, it is up-front grant to award to students with permanent disabilities who have demonstrated financial need. It is intended to assist in covering the costs of accommodation, tuition, books, and other education-related expenses up to $2,000 per loan year. To be considered for this Canada Access Grant, you must apply for and be eligible to receive a student loan through your Provincial or Territorial Student Assistance Office. There is no separate application for this grant, but you must provide proof of your permanent disability with your loan application. 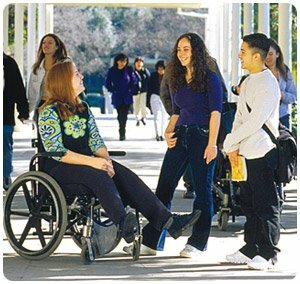 Are eligible for a full-time or part-time Canada Student Loan as outlined for students with permanent disabilities. How cheap can you be?!? If it was their own people you will see heads down that they will get help, I do not get why there is so much non sense in the education department. One word that I could say our government is plain heartless!! While I do not know how the other provinces deal with the issue of loans and bursaries for students with disabilities, I, for one, have nothing but praise for Quebec’s Aide Financière aux études. As a matter of fact, my experiences with the services the province offers on all levels has been very positive. From providing occupational and physiotherapy, equipment from walkers to various forms of wheelchairs, maintenance and repair on this equipment as well as replacement of outdated equipment. The Canadian Medicare system, while stretched to its limits, provides a multitude of services that families and recipients of care would otherwise be unable to benefit from. It is easy to complain about ‘the system’ when you are not getting the service you believe you are entitled to, but in an over-view of the services and monies invested in students with disabilities, my opinion is that Quebec is doing a pretty good job.